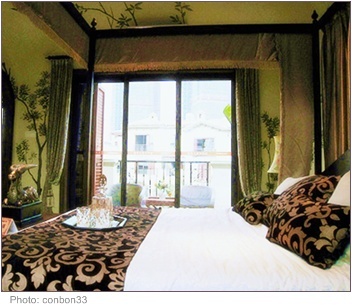 How do you create a charming and luxurious interior with decor? Glamour is enticing and arresting. It says that you know your own mind, that you are in love with luxury. Personally, I don’t think that you need to be wealthy to create an atmosphere of sophistication. You just need some careful planning. First you need to decide what glamour means to you. It helps to look at pictures that exude the charm you want to create in your home. Do you like ultra-modern interiors with sparkle and pizazz? Do you like hotel-room plush? To go about creating a glamorous mood in my home, I would choose the embellished formal feel of a luxury resort. I’ll describe to you how I would do this, but just remember that creating a certain ambience in your home is extremely personal. You should choose the colours, fabrics and adornments that feel right to you. Glamour isn’t just one thing, it is whatever you want it to be. My standard starting block for creating any mood is to choose the correct colours. I want colours that make a space feel elegant and lush. If I picture, or look at an expanse of, a colour and it evokes the right feelings - sophistication and loftiness - then I add it to the list. I describe glamour in opulent colours in rich tones like gold, cream, black, burgundy, purple, and blue. A really rich atmosphere can be brought about by using a limited colour palette here. I think more contemporary furniture provides the right character for elegant home decor. The softer furnishings are the star of the show here and the clean lines of contemporary pieces allow them to sparkle in their own right without upstaging them. The right fabrics exude beauty and charm. Luxurious, sumptuous fabrics that are soft to touch should be extensively layered to create a dramatic effect. Use velvet, satin, silk and cashmere, soft blankets and deep pillows. A bed canopy is also a great decor glamour addition and if you are DIY-inclined, is simple to make. For windows, nothing says extravagant to me like professionally made floor-to-ceiling curtaining with co-ordinating decor rods or pelmets. Just this treatment alone is enough to glamorise your entire room, even if you keep your other accessories simple and harmonious. Another must-have is lamps, as they add that touch of formal elegance to a space. For beautiful bling you could add diamanté embellishments, and even a chandelier. Just don’t go too overboard with this or it can end up looking cheap and tacky. The key to decor glamour flooring in my book is uniformity. The same flooring throughout the home in a beautiful neural colour is a bonus, whether it is wooden floors, carpeting or tiles. In places where the flooring is not the same, or to create little areas or nooks, a simple unfussy area rug in a natural fabric and neutral colour would be my choice in glamour decor. 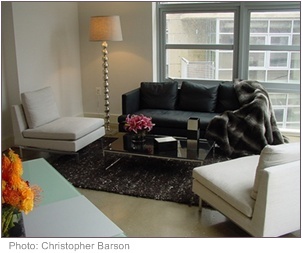 Now what if you have a room you want to glam-up? Where do you start? 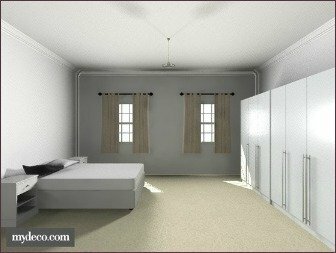 Below is a picture I created of a standard bedroom. This may be very similar to a bedroom in your home, consisting of a standard bed, melamine cupboards and a light coloured carpet. And now for the glamorised version. •	Glamour was introduced by choosing a limited colour palette based on what would not be changing. 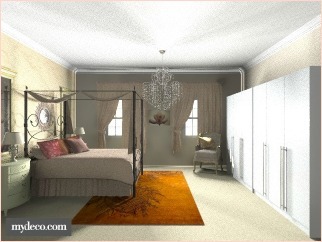 In this case because the carpet needed to stay, I chose soft gold, taupe, cream and burnt orange. Furthermore, I repeated colours in layers for a plush effect. 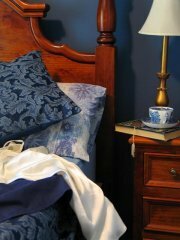 •	I used a four poster bed here, but if that's not to your taste you can glam-up any bed with an upholstered headboard (especially if it has some bling or deep-set buttons). •	The main glamour comes from accessories - I used a chandelier, and mirrors. Also, don't forget the fancy bedding and curtains. •	Any additional accessories you want to add to enhance the feel will be great - like my armchair over by the cupboard and the matching table lamps. So there you have it! Easy glam.